Is that a Webworm or a Bagworm? Webworms, bagworms, are they the same thing? If not, why does it make a difference whether you have a bagworm or webworms? It can make a big difference which insect you have to control and the damage that they cause. Correct identification is key to know how to control these pests. Fall webworms or tent caterpillars are an occasional pest. They are sometimes called ‘bagworms,’ but using the correct common name will help clear up confusion. They appear as white webbed nests on the ends of branches in cottonwood, crabapple, walnut, and other trees. The caterpillars hide in the webbed nest during the day and feed on the trees at night. The caterpillars cause little harm to otherwise healthy trees. Tree health is not usually affected until more than 50 percent of the foliage is eaten. If there are enough nests, about one on every branch, the tree could be completely eaten. If you can safely reach the nest, use a broom to break up the bag of webworms. Follow up by spraying with a strong stream of water or an insecticide like permethrin (Eight) or Spinosad (Conserve). The nests can also be pruned out when possible. Trees that have heavy infestations this year won’t necessarily have a similar outbreak next year. Bagworms are a whole different story from webworms. Bagworms will feed on a wide variety of trees and shrubs, but they mainly prefer evergreens, especially junipers, cedars, and spruce. The reason that they are called bagworms is because they spin their own individual cases or bags around them for protection. As the bagworm grows, so does the bag that contains them. They will add leaf fragments to the outside of the bag for camouflage. The bags look like baseball bat-shaped ornaments hanging from the trees. There is one way to know if your cedar tree has bagworms. If you see little cone shaped things on your cedar tree, more than likely you have bagworms, because cedar trees don’t produce cones. The earliest sign of bagworm injury on junipers is brown stressed needles at the tips of the branches. If the infestation is severe enough, the tree they are feeding on will have a brown tint to it. Heavy infestations of older bagworms are capable of completely defoliating a tree or shrub. This can cause stress to the plant or even kill it if damage is great enough. This is especially true if they have infested an evergreen which is unable to re-grow new foliage until next year. If you have bagworms on any deciduous plant, ones that lose their leaves every year, they are able to re-grow foliage if needed. Just be sure to pick up the leaves this fall and dispose of them. There are several options for controlling bagworms. Insecticidal sprays require thorough coverage to penetrate the canopy and contact the feeding bagworms. It is generally preferable to use ground equipment with higher spray volumes and pressures. Aerial applications may fail to provide thorough enough coverage resulting in less than satisfactory bagworm control. The spray has to completely cover the plant, almost to the point the product is dripping off of it. If the bagworms have made their home on a windbreak, the applicator has to be sure to have enough pressure to get product between the two rows of the windbreak. If this area is missed the bagworms that were hiding out there will move and re-infest the rest of the plant. Hand removal is another option for controlling bagworms. After removing the bags, place them in a bucket of soapy water. 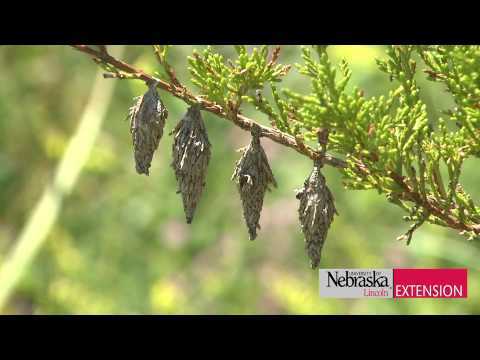 There are several options available for insecticidal control of bagworms. Some of the reduced-risk options include Bacillus thuringiensis (Bt), spinosad, or azadirachtin (neem oil) are effective on young larvae and may be needed to be applied repeatedly. Additional insecticidal options include permethrin (Eight), bifenthrin (Talstar), cyfluthrin (Tempo), chlorantraniliprole, carbaryl (Sevin), dimethoate, esfenvalerate, fluvalinate (Mavrik), lambda-cyhalothrin, acephate (Isotox IV), and tebufenozide (Confirm). Depending on the product and size of the insect, secondary applications may be needed. Be on the lookout now for webworms and bagworms and control them before they make a meal out of your plants. 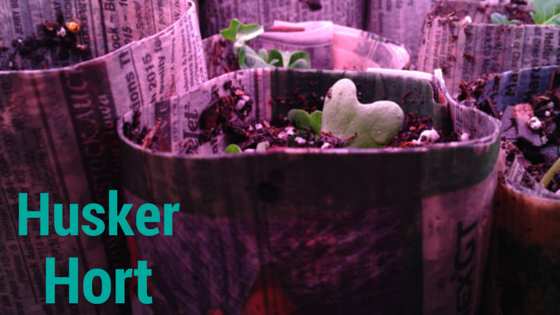 For more information contact Elizabeth Killinger at elizabeth.killinger@unl.edu, 308-385-5088, on Facebook, Twitter, her blog at https://huskerhort.wordpress.com/, or visit the University of Nebraska-Lincoln Extension website: hall.unl.edu. Categories: Insects, Trees | Tags: bagworm, UNLExtension, webworm | Permalink. Reblogged this on JenREESources's Extension Blog.